A list of 151 popular and catchy spa slogans. These slogans advertise the peace and relaxation gained from visiting a spa. A brilliant hand of caring. A day in heaven on Earth. A natural lifestyle of joy. A nature breeze of relaxations. A new beauty of perspective. A new change of life. A special place for women. A sweet escape. Even sweeter prices. All the flavor of being a girl. Beauty and success starts here. Come a live a lifestyle experience. Creating your beauty at a whole new level. Dignify your body and soul. Discover the real beauty in you. Easy Breezy Beautiful Cover Girl. Exceptional beauty for the exceptional face. Feel the SPArkle in your body. For the woman of essence. Get what’s coming to you. Give your Style an Urban Touch. Giving Look Of the Future. Giving Smile on your Face. Helping your Style to Be Better. Helping your to look Great. Move up, You Can Shine. One salon and spa at one fitness. Our only competition is 93,000,000 miles away. Perfection is framing the face. Progressive styling in a nurturing environment. Rejuvenate to stand out of rest. Revitalize your beauty, Revitalize your soul. Spa for your style fitness. The future of your care. The most colorful name in Beauty. The place that beautifies your face. The place that leaves you feeling great. The salon that leaves a smile on your face. The world’s first cultural spa. There’s no place like this for indulging. There’s no place like this for sheer indulgence. This is the real holiday. To rejuvenate your body and soul. We bring out your inner beauty. We create style for the way you look and the way you live. We Make up your face. When you deserve to be indulged and pampered. Where passion and creativity meet. Where your body meets your soul. You are beautiful because we care. You deserve the best today. Your New Look Will Inspire You. The below infographic outlines the industry growth statistics and trends of the spa industry. 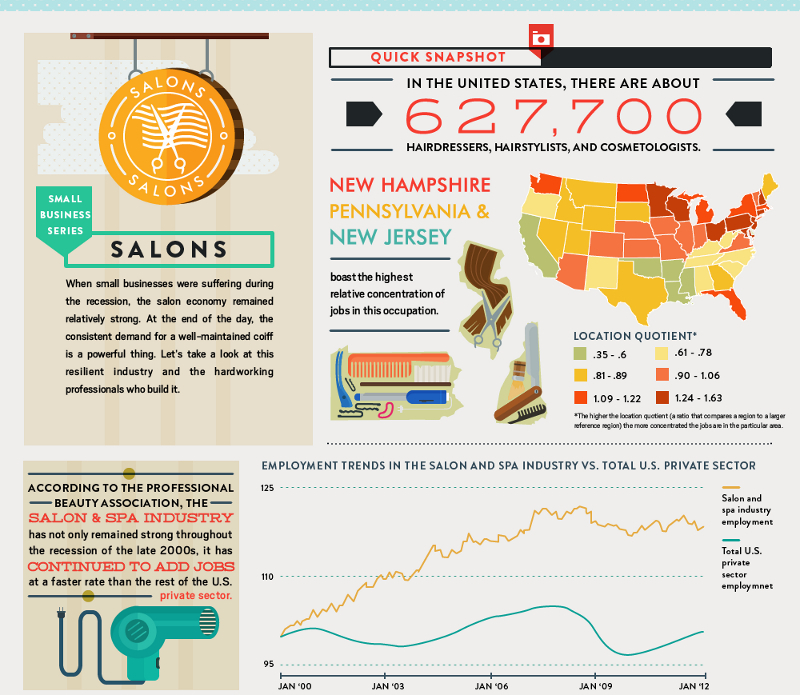 There are currently over 620,000 hairdressers, hairstylists, and cosmetologists throughout the United States.